The flavor in this dish is DYNAMITE! Especially if you like the snap that fresh ginger brings to a marinade. The recipe comes from *The Six O’Clock Scramble. So savory and a real win over here at Refined + Rugged. Try it for yourself! I’d love to hear how yours turns out. Chop: Chop the onion in half top to bottom and then thinly slice. Grate the pear and the ginger. Mince the garlic (I use a garlic crusher.) Slice the steak into thin strips cutting across the grain. Mix: In a large bowl mix the soy sauce, sesame seeds, sesame oil, ginger, garlic, and onion. Add the steak and coat thoroughly. Marinate: You can marinate this dish for as little as 10 minutes and as long as 24 hours. I am a huge fan of the 24 let. it. sit! But tonight we were strapped for time, so I gave it a good 15 minutes which is all I had to give! 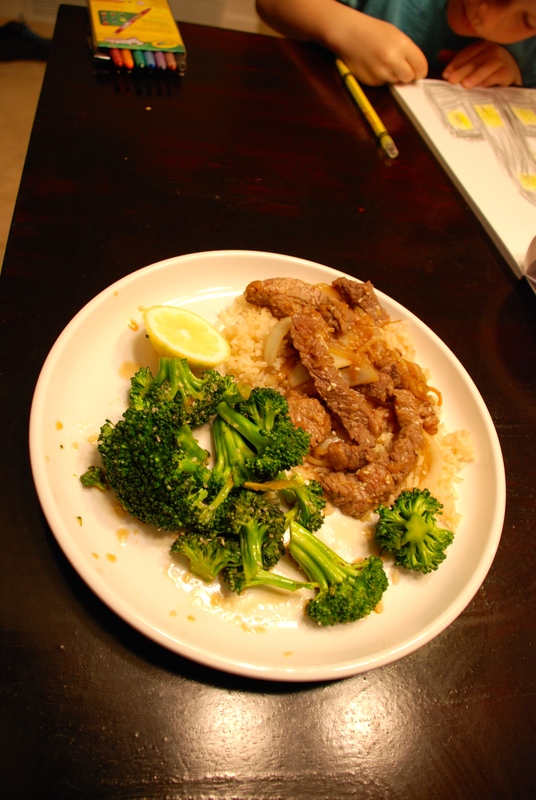 Start: If you are planning on using quick cooking brown RICE, you can start it now before you add the meat to the skillet. (I was using the 45 minute jobby, so I started my brown rice before I began any meal prep whatsoever.) Now is also a great time to start your steamed you broccoli. Sauté: Saute the meat by putting 1/2 of the meat (plus marinade and onions) into a piping hot skillet. Cook for about 4 minutes. Remove to a serving dish and then cook the remaining 1/2 of the meat for 4 minutes. Steam: I actually sautéed our broccoli in 1 Tbsp. olive oil and then added 2 Tbsp. water and covered it for about 10 minutes (maybe less). I added sesame seeds and a Tbsp. 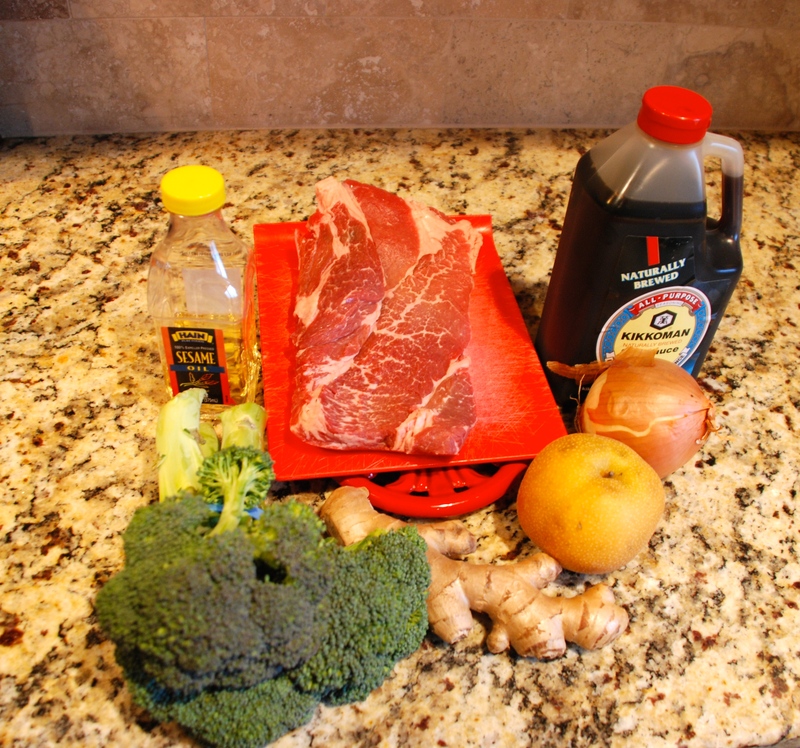 of soy sauce to the broccoli just before it was done. *The Scramble is a meal planning service to which you can subscribe here. For a fantastic price you will receive 5 weekly meals which means 5 recipes, complete grocery list, the ability to tweak the number of people you are making for, and full nutrition facts. PLUS tips as to how best to PREP your meal beforehand, add a punch of FLAVOR, and how to SLOW COOK almost every recipe if you’re especially slammed that night. This wonderful service really does live up to it’s name. You can come home at 6 p.m. and be sitting down to a DELICIOUS, HEALTHY, HOME COOKED meal by 6:30 p.m. most nights. What I love about this is that it’s real, home poked not super complicated and yet something that my whole family will eat. Too often I find recipes that require so many ingredients or ingredients that I might not use again and then go to waste. I’m looking forward to trying this out. I also re-signed up for the scramble….I do think it’s a fantastic resource with meal planning. Thanks for sharing yet another wonderful idea to implement into my crazy life!!! !